TLE TeachLivE is a mixed-reality classroom simulator that uses avatars. It’s Monday morning in a small classroom in Orlando, and a teacher is trying to start the day’s lesson. Maria, sitting in the back, won’t raise her hand — she’s too shy to speak. Sean, an energetic redhead who won’t stop talking, is monopolizing the class discussion. Cindy pulls out her cellphone to answer a text from her boyfriend and refuses to put it away. The teacher panics, unable to gain control, and suddenly says, “Stop classroom.” The children freeze, and the teacher turns away to gather her thoughts. This is no ordinary schoolroom. 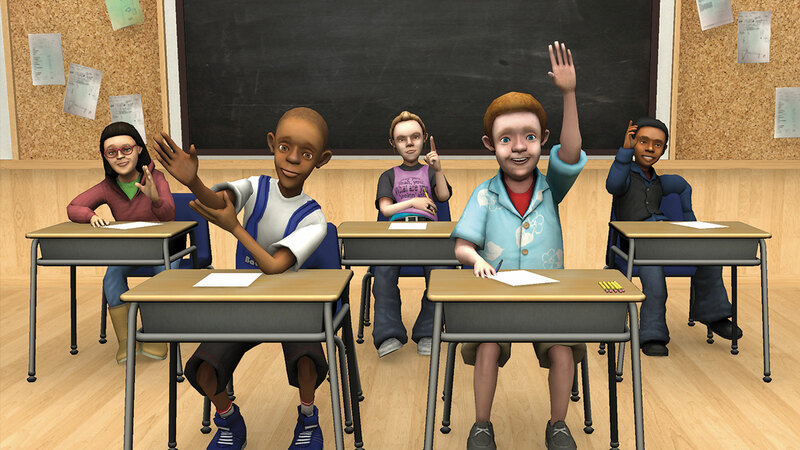 This is TLE TeachLivE, a mixed-reality classroom simulator with avatars. Back in 2005, Lisa Dieker and Michael Hynes, both now Pegasus Professors in the College of Education and Human Performance, had an idea that seemed far-fetched at the time: Could teachers improve their performance — like soldiers or pilots — through simulation? They took their question to Charles Hughes, Pegasus Professor of computer science. And from there, the three, along with an interdisciplinary team, created a system that’s changing how teachers are trained. It was difficult in the beginning. The technology was expensive and not many people jumped at the idea of interacting with characters on a screen. But in 2012, the TLE team received a $1.5 million grant from the Bill and Melinda Gates Foundation to study the effects that occur when teachers use the system. The research found that after only four 10-minute sessions, the simulator bettered teachers’ targeted behaviors and transferred the improvements back to their classrooms. The funding also allowed the team to create partnerships with educators around the world, including Australia, Italy, Malaysia, Mexico, Switzerland and the United Arab Emirates. Now, TLE is the leading lab in the U.S. using a mixed-reality environment to prepare and retrain future and current teachers. The patented system works from two ends. On one end, a teacher views a screen on which a simulated classroom is projected. A motion-capture device and camera read the teacher’s movements. On the other end, an interactor controls the student avatars in the classroom, speaking through a microphone and using head-mounted and handheld controllers programmed to respond to certain movements. TLE started with five middle school-aged avatars: Maria, Sean, Cindy, Ed and Kevin. Then, high school-aged versions of the same characters were created. More recently, adult avatars to simulate other teachers, counselors or parents were added. Teachers, administrators and even students use the system to address a variety of scenarios that crop up in classrooms daily. Each avatar has his or her own personality, portrayed through a mixture of human control and specific programming. The team’s newest ventures include creating avatars that represent students with disabilities and designing an entirely new classroom with kindergarten-aged avatars. Jacqueline Rodriguez ’13 PhD, now an assistant professor at the College of William & Mary, was a co-director and principal investigator of the TLE program in its early stages. She says that after teaching in diverse schools in Washington, D.C., she was skeptical that the system could provide authentic experiences for teachers addressing the complicated needs of many students. But that changed when she started to use it. Dieker, who holds the Lockheed Martin Eminent Scholar Chair, compares the system to pilots who use a flight simulator. This, Dieker says, is not a system designed to completely replace practice in real classrooms. It’s simply a way for teachers to improve in a specific area. In 2015, the research team entered a public-private partnership with Mursion, a California-based organization that licensed the commercial rights from UCF to develop further and deliver the simulator technology. With this partnership, the technology has been implemented in more than 80 colleges of education and in a small number of school districts across the country, including Seminole County Public Schools. But the technology is also being used outside the classroom: to help children with autism develop communication skills, to help hotel clerks develop better customer service skills, to train students looking to become nurses and physicians, and to prepare college students for job interviews. It’s even being adapted by the UCF Police Department to train officers in de-escalation tactics. No matter the application, Hughes says, there is only one goal for the technology they developed: to help people. “That’s what we want to do … to help people reach their potential, whether it’s a first responder … a nurse, a physician or a teacher,” he says.